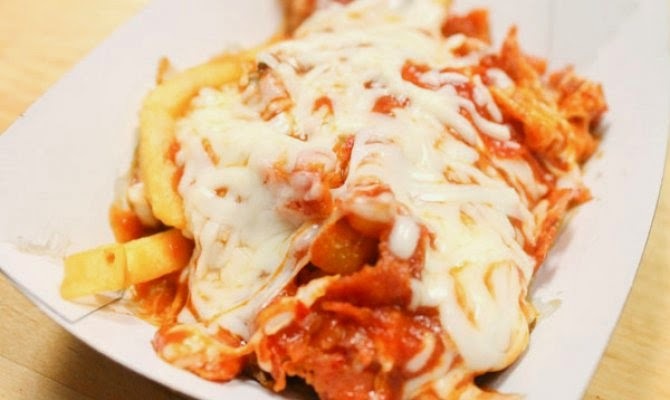 All you ever wanted to know about the pure, greasy decadence of Pizza Fries. 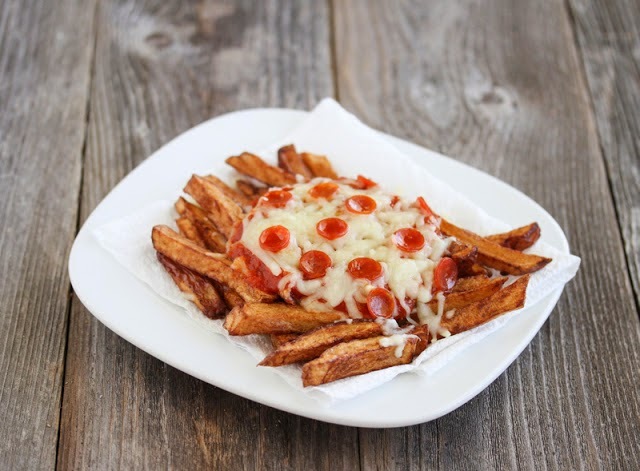 I found the original of this pizza fries picture here, but no recipe. I never would have thought of such a thing myself, but the photo above came floating across my husband's Facebook newsfeed a couple of days back, and I found myself somewhat.... amazed. 1. Prepare the fries according to the directions and remove them from the oven. Leave the oven on after removing the fries. 2. Pour the sauce over the fries. 3. Top with the cheese and pepperoni (if desired). 4. Bake for 5 minutes or until the cheese is melted. 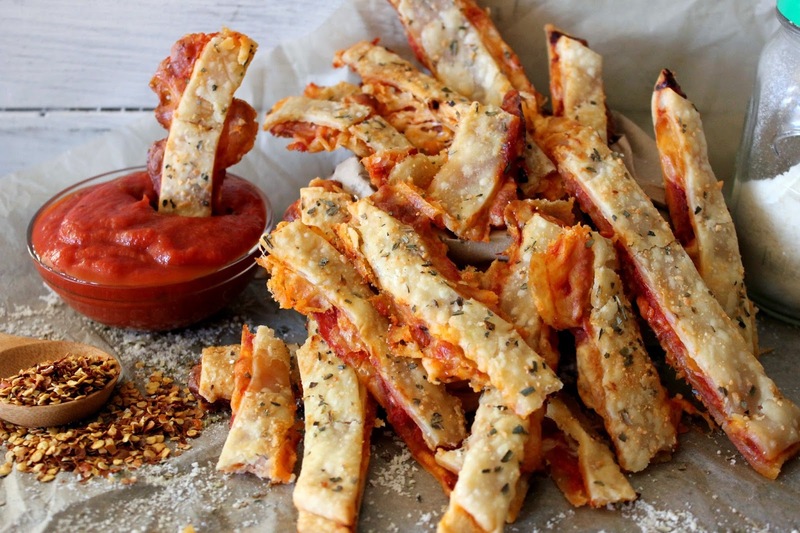 Pizza Fries from the Daily Meal (link below). 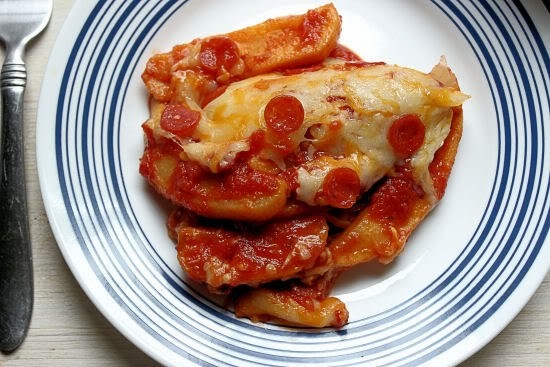 Credit "Jane Bruce"
Here's another similar pizza fry recipe from the Daily Meal: The fry chef is urged to fry (or bake) the fries and mix them with pepperoni first; then tomato sauce, then cheese, then a minute or two under the broiler. It's very similar to the recipe above, with the difference of mixing the fries (either fried or baked) with the pepperoni and then broiling the whole thing for a minute vs. putting it in the oven for five or so minutes. I found a recipe that just makes a kind of pizza and cuts it into fry-shaped pieces. 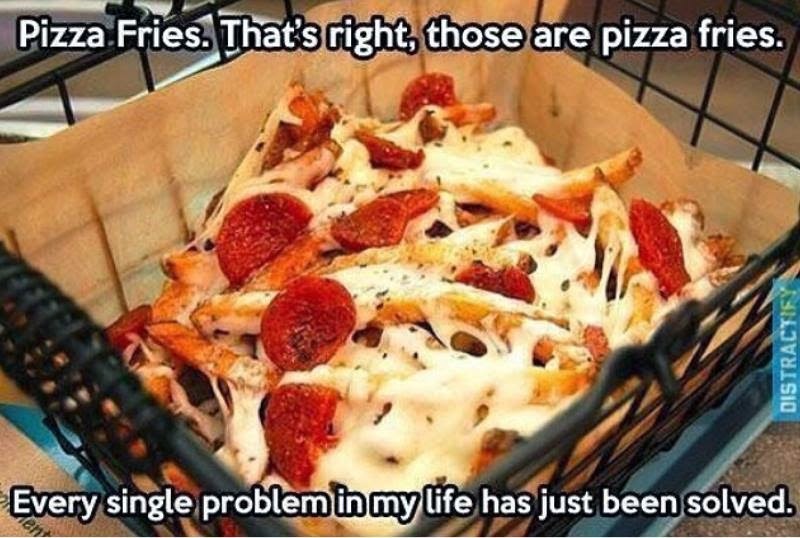 However, I don't really think that's the same thing as "Pizza Fries" even though they call them "Pizza Fries". If you are interested, just follow the link. She layers the baked fries, then adds the pizza topping, then more fries and a final layer of pizza topping, cheese, and pepperonis. Kind of like a pizza fry lasagna. Recipe above the picture at the link. There's a similar recipe here.. You fry the fries before you put them in the pizza. 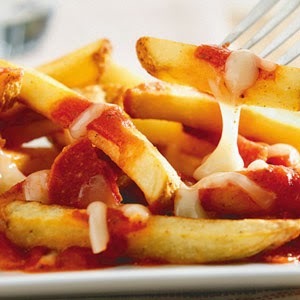 I'm not going to include all of the directions for these variations of pizza fries; I've included pictures and links. Just follow the links if you are interested! The best for last-- You not only top the pizza fries, you actually peel and fry the potatoes (or you get someone to peel and fry those potatoes.). I made my own fries, then topped them with mozzarella cheese, tomato sauce, more cheese and some mini pepperonis. I melted it in the oven for a few minutes before serving. Yum. 1. Peel skin off potatoes. Slice into fries, about 1/4 inch thick. Use a paper towel and dry potatoes as much as possible. 2. Pour oil into frying pan, about 2 inches in height. Drop in potatoes. Turn on stove to medium high heat. When oil heats up the potatoes will begin to bubble. 3. Continue to let the potatoes fry and bubble until they turn brown and crispy on all sides. You may need to use a spatula to separate potatoes so they don't stick together. 4. Remove potatoes when done, soaking excess grease on paper towels. Scoop finished, drained fries onto an oven-proof serving plate. 5. Add half the cheese, sprinkling over plate of fries. 6. Scoop marinara sauce on top of cheese. 7. Add remaining cheese and top with pepperoni. 8. Heat in oven at 350F for 5-8 minutes until cheese is melted. Serve immediately. Immediately. Don't mess around with these; get the gang or the kids or the men or the women eating these RIGHT AWAY. Or they will be gone.